This is my final of 3 posts for The Medicine in the Movies Blogathon being hosted by Charlene of Charlene’s (Mostly) Classic Movie Reviews. Brief Synopsis – Based on the true story of a medical student who wanted to heal the world through the power of laughter. My Take on it – When thinking of this kind of role, obviously Robin Williams is perhaps one of the best casting choices because he fits in so well with this kind of character. Unfortunately, it feels as if he is being held back from really letting himself go here and that actually hurts this films premise which is quite good, but just doesn’t work as well as it should. Too many of the supporting characters are simple archetypes and also hinder this film from being as heartfelt as it should be and holds things back too much. This is quite unfortunate because the supporting cast is also quite talented with Bob Gunton, Philip Seymour Hoffman, Peter Coyote, Daniel London, Monica Potter, Harold Gould, Harve Presnell and Josef Summer trying to break free of this typical Hollywood style script. Unfortunately, this is a premise that could have been a wonderful film but it isn’t as powerful as it could be because they wanted it to feel too mainstream. Bottom Line – A film with a great premise that just doesn’t project well enough. Williams is great for the title role yet he feels as if he is constantly being held back from really running with the character. Too many of the supporting characters are blatant stereotypes and that actually hurts the storytelling that could be much more powerful. Great supporting cast that are bogged down by a script that tries to be too mainstream instead of being as powerful and moving as it could have been. There was a time, when I was 14, that Patch Adams was my favorite movie and Robins Williams my favorite actor. Even though I still love Williams and got very sad wen he died, I’m happy that I have evolved as a filmgoer. 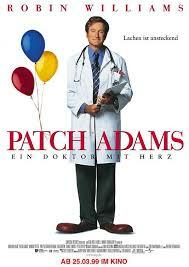 I see now that Patch Adams is flawed, but still a terjerker – what it was supposed to be since the beginning.